I say, eat meat in moderation, skim off as much fat as possible and enjoy good food when you can. On the subject of ground turkey, I have tasted several sources and discovered that the quality varies so widely that some is actually horrible. 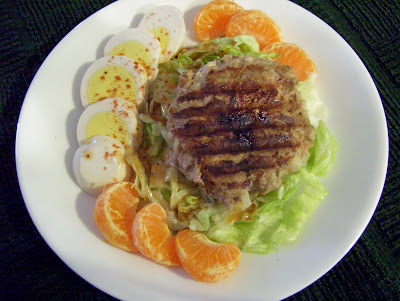 Because of the inconsistent value, I had virtually ignored ground turkey for many years until one of my sons decided he would create the ultimate turkey burger...which he did...and it was delicious. When he told me how and what he mixed in with the meat, I realized that he had really created miniature versions of my meatloaf...with ground turkey meat. Not to be outdone, I bought my own ground turkey and mixed a batch of burgers...they, too were wonderful. There was an added bonus, after eating the burgers, I did not have that heavy feeling which often accompanies the digestion of beef. I hope you will try these wonderful, low fat burgers soon...buy the best, freshly ground turkey you can find...(not in those frozen bullet packages). Note: Foreman Grill used for pictured buger. In a small pan add 1-2 T margarine; melt over medium heat. Add green pepper and onions and sauté until onion is soft. Set aside. In a bowl mix ground turkey and all the other ingredients, (I use my hands for this process). Mix well. Add sautéed vegetables. Cover bowl with plastic and refrigerated for 30 minutes or until cold. Make burgers desired size. Grill until meat is no longer pink in the center. Makes 4-5. Burger with bun: Make your own buns (post # 5) or just buy good quality buns. Split buns, toast them if desired. Spread each half with Hellmann's mayonnaise, add shredded lettuce, burger, tomato, sliced onion and mustard. Enjoy! Optional toppings: pickles, sauteed mushrooms, turkey bacon. Marian wote: I think the turkey burger idea is a good one, but I, too, have had problems with the quality of the meat. When you were in this area, where did you buy yours? Thanks. * Note from Diane...I have limited access to ground turkey here in the Ozarks, but Walmart has a very good turkey source. The packages are rectangular and the turkey does look freshly ground. If you have your own little meat grinder...you could grind your own turkey! I actually do have a ginder...maybe I will try it out on turkey meat and post the results later.